"Cromer Yard Box" at Cromer station in BR days. Cromer Yard Box was closed in 2000. 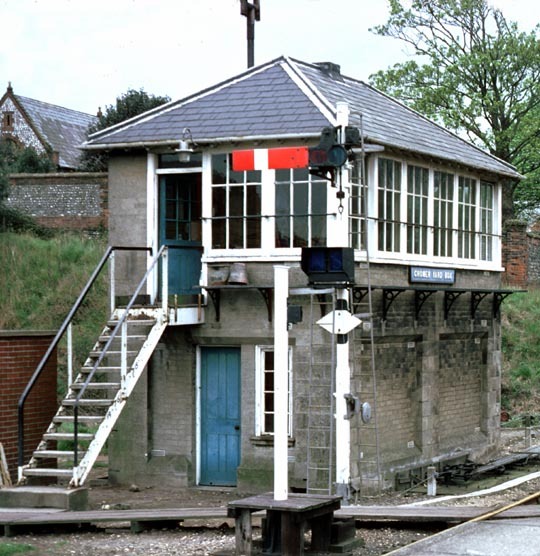 This signal box which looks like stone is in fact made of concrete. This signal box was built in 1922. This Midland & Great Northern Joint Railway box, concrete blocks were made at the railways Melton Constable works. This is the only box built to this design left. 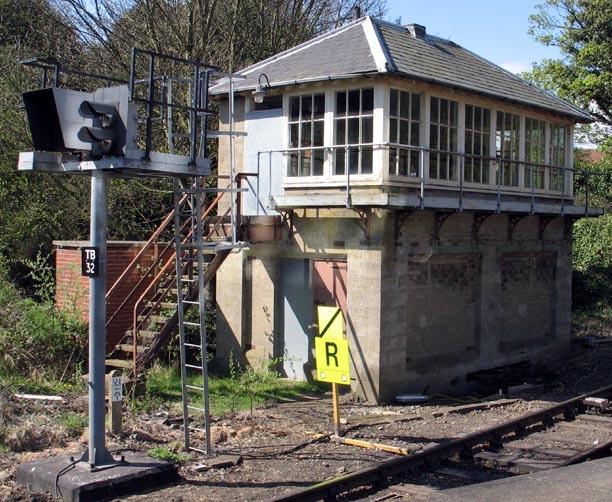 The box which is grade 2 listed was saved when the line was upgraded in 2000 with colour lights and this part of the line then controlled from Norwich. The Cromer Railway Signalling Society has now saved this box. Unlike many other boxes now saved, this box has not been moved and has been saved on site. Two of the semaphore signals which were also Grade 2 listed have been moved away from the running lines and put up near to the box. A fence has been put up now around the box. Details of when any open days are or if you can help them are on their site. To days Cromer railway station is now part of the Bittern Line. The Bittern Line is a Community Railway Partnership that supports and publicises the railway from Sheringham to Cromer and to Norwich. This Partnership was formed by Norfolk County Council and the then local railway company back in 1997. The line has got busier and trains now run every hour at peak times and can be very full on Saturdays when the NNR has a big day and holiday makers are going to the seaside at Sheringham and Cromer. Passengers also go shopping at Norwich and to the football. The Community Railway Partnership has not only kept the line open but has got more passengers and trains running.